Fort McDowell was established by the California Volunteers on the west bank of the Verde River in September, 1865. Situated in the midst of Indian country and surrounded by mountains, the area around the isolated location still contained several often used travel routes. Created to protect the area from the fierce Apache who roamed the Salt and Gila River Valleys, it was built to be one of the most solid posts in the territory. 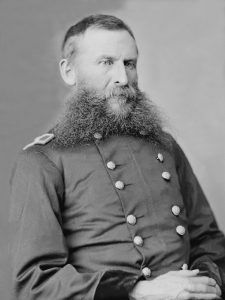 The camp was first called Camp Verde, but was later renamed to Camp McDowell after Major General Irwin McDowell, made famous for his loss of the first large-scale battle of the American Civil War, the First Battle of Bull Run. 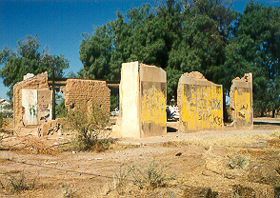 The fort became an embarkation point for many of the expeditions against the Apache, including becoming the base of General George Crook’s Tonto Basin campaign in the early 1870’s. 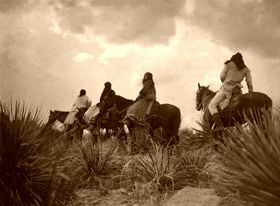 During the winter of 1872-73, nine detachments, using Apache scouts recruited from the reservations, crisscrossed the Tonto Basin, in constant pursuit of the Apache. Wearing down their opponents, the soldiers forced as many as 20 different skirmishes, resulting in the deaths of about 200 Indians The fort’s most decisive victory was the Salt River Canyon Battle in December, 1872, when two companies of the 5th Cavalry, along with 30 Apache scouts surprised a band of more than a hundred Yavapai as they tried to emerge from a cave deep in the recesses of Salt River Canyon. the victory was instrumental in bringing the campaign to a close. On April 10, 1890, the fort became the Fort McDowell Indian Reservation, serving the Mohave, Apache, and some Pima Indians. In 1903, additional land was set aside for the reservation. The site of the old fort is just west of the Fort McDowell Indian Agency in Maricopa County. Overgrown with vegetation, the only original building left are the ruins of the officers’ quarters. However, low earth mounds and adobe remnants mark the location of other structures.